An inguinal hernia occurs in the groin when tissue bulges through a weakened area in the surrounding muscle. 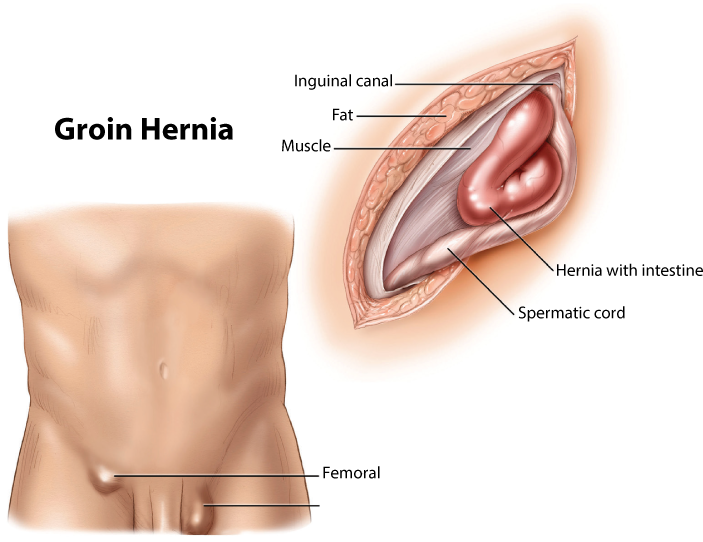 This type of hernia accounts for nearly 75% of all hernias and happens most often in men. It appears as a bulge in the groin or scrotum that may cause numbness and irritation due to pressure on the nerves around the hernia. Inguinal hernias are very common in men. The area where inguinal hernias occur is the opening through which the testicles descend during fetal development. It usually closes up before birth except for a small space allowing the spermatic cord to pass to the scrotum. But if it doesn't close properly, it can leave a natural weakness that may bulge later on. You’re at an increased rate of developing inguinal hernias if you are overweight, have a persistent cough, or have consistent strain on your body. Make an appointment with Dr. Dunning promptly if you think you are suffering from an inguinal hernia. Hernias left untreated will not go away on their own and may become worse. Don’t wait for symptoms to worsen, contact Dr. Dunning at the Ogden Clinic department of surgery today for a diagnosis and potential inguinal hernia repair. Until about 25 years ago, hernias were repaired with ‘open tension’ surgery. This means a 3 to 6-inch incision was made in the abdomen to access the hernia. The surgeon pulled together the healthy tissue and sewed up the hernia with sutures. Thankfully, new techniques have been developed and there are multiple options for inguinal hernia repair in Ogden. Contact Dr.Dunning today to see what option would be best for you. Most inguinal hernias can be repaired using minimally-invasive laparoscopic surgery. Also called TEP (total extraperitoneal repair), laparoscopy is Dr. Dunning’s forte and it’s changing the inguinal hernia repair recovery pattern for hundreds of people in Ogden and the surrounding areas. Dr. Dunning inserts responsive instruments through tiny incisions in the abdomen through which he is able to visualize and perform the procedure. Laparoscopic inguinal hernia repair in Ogden uses mesh for reinforcement, so it has a lower recurrence rate. The smaller incision translates to less discomfort after surgery and much smaller incisions. Many people return to work within a few days because recovery is much quicker. Learn more about laparoscopic hernia repair in Ogden here. Is hernia repair covered by insurance?